Home Columnists My child still has a Statement of SEN: What should I do? 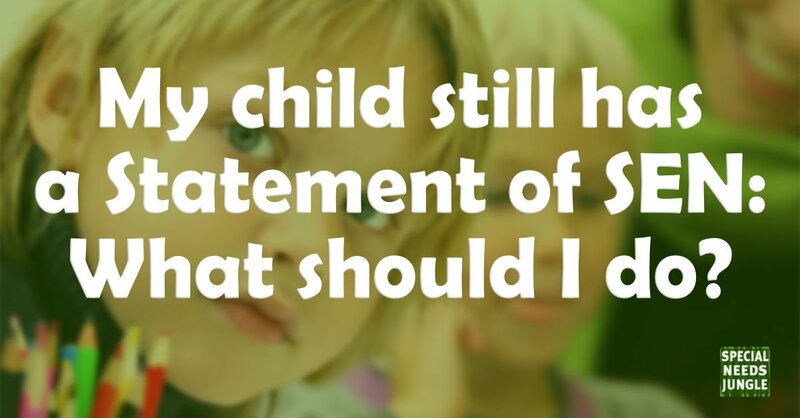 My child still has a Statement of SEN: What should I do? For all parents of children/young persons who currently have a Statement of Special Educational Needs, your local authority is required to have transferred their Statement to an Education, Health, and Care (EHC) Plan by 31st March 2018. This is a statutory deadline and your Local Authority must comply with it. You may have been informed that one of the reasons your local authority has not yet transferred your child/young person’s Statement to an EHC Plan is because it is “currently experiencing cutbacks” or “the process is delayed?”. Perhaps your LA is “currently experiencing a shortage of staff” and “will transfer your child’s Statement as soon as possible?” None of these reasons offer a legal ‘get-out’. We already know from the Department for Education National Statistics, published on 25th May 2017, that in January 2016 there were 182,106 children and young people with Statements. By January 2017, only 59,545 children and young people had transferred from Statements to EHC plans; this is a success rate of just 32.7%. It therefore came as no surprise that in September 2017, the Department issued a letter to all LAs raising concern about their ability to meet the 31st March deadline. The whole transfer process from Statement to EHC Plan must take a maximum of 20 weeks. This includes a minimum two week notice period of the date the EHC Needs Assessment will begin, followed by a maximum 18 weeks before the final EHC Plan is issued. As a result, to transfer your child/young person’s Statement in line with the 31st March deadline (and the 20-week timeframe) the transfer process should have commenced by Friday 10th November 2017. Yes, it's already passed. The ‘transfer process’ from a Statement to an EHC Plan will take the form of an ‘EHC Needs Assessment,’ formerly known as a Statutory Assessment. It is the same assessment that the LA is required to conduct for children/young persons who may be receiving an EHC Plan for the very first time. Just because your child/young person already has a Statement does not mean a full EHC Needs Assessment should not be conducted. Far too often do I see EHC Plans where the Local Authority has simply ‘copy and pasted’ information about the child/young person from their Statement straight into their new EHC Plan. This is wholly inadequate. Just because your child/young person already has a Statement does not mean a full EHC Needs Assessment shouldn't be conducted. Far too often, I see EHC Plans where the local authority has simply ‘copy and pasted’ information about the child/young person from their Statement straight into their new EHC Plan. This is wholly inadequate. As part of the EHC Needs Assessment, your LA is required, as a minimum, to gather advice and information from you as parents or your young person directly (unless your child does not have mental capacity - see my blog on Deputyship for more information on this), educational advice from your child/young person’s current school/college, medical advice, psychological advice, advice in relation to social care and any other advice that your Local Authority deems appropriate. This must be supplied within six weeks of the request. You can also request that the Local Authority seek advice from anybody you think that they should approach, such as current class teachers, teaching assistants and any private therapists. You can also request that the local authority seeks advice from anybody you think that it should approach, such as current class teachers, teaching assistants and any private therapists. The ‘transfer process’ also requires the LA to invite parents to a meeting to discuss the educational, health, and social care needs of their child. This is often hosted by the child/young person’s school/college if they are agreeable. Generally, I have found that most LAs call this meeting right at the beginning of the process (I assume because it reflects the traditional ‘annual review’ format), but it can be called at any point. The important thing to note is that an LA officer who can make SEN decisions must attend this meeting. It is a waste of your time otherwise. Decide to issue an EHC Plan for your child/young person. If your Local Authority decides not to issue an EHC Plan they must notify you of this decision 14 weeks from the date the EHC Needs Assessment began. This should only be happening in a minority of cases where your child/young person’s needs have changed considerably, as the legal test for an EHC Plan is the same, if not wider than that for a Statement. If your Local Authority decides not to issue your child/young person with an EHC Plan, this will give you a Right of Appeal to the Special Educational Needs and Disability (SEND) Tribunal. You will only have two months to Appeal from the date of the LA's letter, or one month from the date of your mediation certificate, whichever is the longer. Do not miss this deadline. If you are unhappy with the Local Authority’s decision, Appeal it. If for no other reason, your child/young person’s Statement must be maintained pending the resolution of the Appeal. Alternatively (and hopefully) if your Local Authority decides to issue an EHC Plan for your child/young person, they must provide you with a finalised EHC Plan within 18 weeks from the date the EHC Needs Assessment began. You should receive a draft of the EHC Plan at a minimum of 2 weeks before this 18-week deadline. It would be most helpful for the draft EHC Plan to be supplied from week 12 (if possible) to allow you to provide comments and for the relevant consultation period with schools to take place before the EHC Plan is finalised. It goes without saying that once you are in receipt of your child/young person’s EHC Plan it is important that you read this carefully. Specifically Sections B, F and I.
I have often witnessed local authorities using the transfer process as an opportunity to reduce a child’s (expensive) provision from their previous Statement and/or name a cheaper alternative placement to that the child/young person is currently attending within Section I. Such reductions of provision without evidence to support the decision are unlawful and if you are dissatisfied with the contents of your child/young person’s EHC Plan following the transfer process, you have the Right to Appeal to the SEND Tribunal. If your child/young person has a Statement and your local authority still hasn't written to you informing you that they will be commencing the transfer process, then unless they are going to complete the transfer in less than the prescribed 20-week period, they are acting unlawfully. Perhaps your Local Authority has written to you informing you that they are going to be commencing the transfer process, but your child’s final EHC Plan will not be issued until after 31st March deadline? Again, they are acting unlawfully. What about if you are currently in the transfer process and you have exceeded 14 weeks since the EHC Needs Assessment began, but the LA has not told you whether or not it will be issuing an EHC Plan? Again, they are acting unlawfully. Perhaps 16 weeks have gone by and you don’t have a draft EHC Plan? Or 18 weeks have passed and you don’t have a final EHC Plan? Again, they are acting unlawfully. On 1st April 2018 all Statements of Special Educational Needs should no longer exist and all children/young persons should instead be in receipt of an Education, Health, and Care (EHC) Plan. Take action now, before it is too late. Do not get stuck in the group of people who are still in receipt of a Statement (post 31st March 2018) which technically, has no legal standing. Put yourself back in the driving seat.